Our non-profit is committed to working to facilitate the opening of job creating, community serving major retail businesses such as supermarkets, Auto service Centers, Clothing and Appliance stores etc., in our targeted Community at 55th Avenue east to the Oakland-San Leandro border where resident consumers can spend the documented existing annual consumer expenditures totaling 3,434,915,781.70 (over 3.4 Billion dollars) in order to transform our targeted community into an economically sustainable community with much needed jobs and economic opportunity. To a great extent the problem of errant behavior of too many of the residents of our targeted East Oakland community is due to unemployment driven conditions of hopelessness and despair. Many in the Black community will challenge this thinking while citing such things as bad parenting, bad schools etc., we start with a given that these exist and move on to work to reduce unemployment in the community. The aforementioned are convenient ways many Black Americans; especially elite Blacks use to avoid accepting a Black responsibility for high rates of Black un employment, The only way to reduce unemployment is with jobs and jobs come only from businesses. Thus our advocacy for Black ownership of job creating major retail businesses. There is a very damaging misconception by many Black Americans, even at the PhD. level that Black owned businesses do no create jobs. We think this misconception may be based on the fact that the businesses that Black Americans traditionally own are small low job creating businesses like beauty and barbershops, laundromats, eateries, liquor stores, and entertainment establishments etc. Black ownership of job creating major retail businesses such as full service grocery stores, appliance stores, furniture stores, clothing stores etc., will create many thousands of jobs in the community if priority is given to establishing Black ownership of job creating major retail businesses in the community. It is important to note that in California the average annual salary for retail workers is $12.99 per hour; and would be adjusted upward to meet city living wage requirements. These entry level retail jobs are a good fit for a community like our targeted East Oakland with a large unskilled workforce. 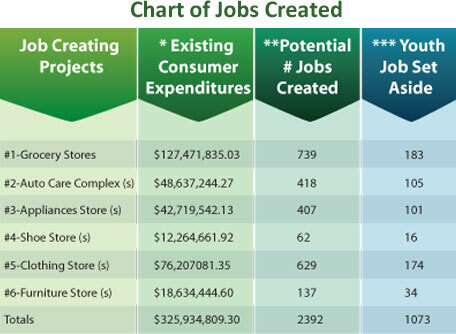 Working with a potential jobs created formula developed from data from the U.S. Bureau of Labor Statistics (BLS) and U.S. Census we have calculated the jobs per million created from just six (6) of our targeted community’s list of 97 different Annual Household Consumer Expenditure categories as shown in the Chart of Jobs Created below. As shown in the Chart of Jobs Created above, our targeted East Oakland community’s Average Annual Household Consumer Expenditures i.e., “Buying Power” potentially creates a total of some 2,392 jobs from just five (6) of the 97 different Annual Household Consumer Expenditure categories by residents of our targeted East Oakland community. Our targeted East Oakland community has “Buying Power” readily in hand. What’s missing are community based major retail businesses to capture this “Buying Power” in the community; preferably Black owned job creating major retail businesses to create jobs in community. We strongly advocate for community based Black ownership of job creating major retail businesses such as grocery stores, appliance stores, furniture stores, clothing stores etc., to capture consumer expenditures in and create jobs in the community. It appears that leadership in our targeted East Oakland community and communities like do not have a clear and complete understanding of the economics and job creation aspects of American Capitalism and its application at the community level. Understanding this would motivate community leadership to make establishing locally owned job creating major retail businesses a high priority. Our non-profit is making this our highest priority in order to create jobs, grow Wealth and economically revitalize our targeted East Oakland community. Black America, more specifically Black America leadership must come to understand that government responsibility with respect to job creation is limited to a legal guarantee that all American s and American groups have a legal and equal right and opportunity to pursue job creation and economic well-being under the economics of American Capitalism. Further, a guest speaker on a recent CNN presentation stated in effect that the government, nor anyone else, not even the president will ever create jobs in low income urban communities because of the strong lobby for the Prison Industrial Complex and other persons and entities that benefit from the demise of residents of these communities. This was chilling to the ears. What was more chilling is that not one of the several persons at the discussion table disputed this. There was silence and the discussion moved on to another topic. Our targeted East Oakland community and communities like it must make finding a way to open community based, community serving major retail businesses a high priority in order to create jobs for the community or continue with an inordinately high unemployment rate that induces conditions of hopelessness and despair and the errant behavior caused by these condition. Black America has documented “Buying Power” and available funding within community to do this. The failure of Black America and Black America leadership to make putting documented, existing community consumer expenditures to work to create jobs fa highest priority is indefensible and destructive to Black America. Currently Black America is out of synch with American Capitalism because we do not produce, even at the retail level, we just consume. The Promised Land that Martin Luther saw had to have been seen tough the eyes of American Capitalism. If so the path to the promised-land must be an economic path. Capital is described as the sum of one’s wealth and property. Only when Black America comes into sync with Capitalism and make business ownership of job creating businesses in Black communities as high of a priority as civil-rights will Black America thrive under American Capitalism. Black America must put civil-rights in proper perspective. There are laws against discrimination in the same way that there are laws against running a red light but America does not devote its total resources to catching red light runners. Policing of red light runners is left to a designated function; policing. By the same token Black America cannot continue to devote all of its resources to civil-rights at the expense of economics and job creation as has been the case for decades since the civil-rights era. We should monitor civil-rights while working to make funding for new businesses available to would be businesses owners in the Black community in order Black America to own businesses, create jobs and grow Black wealth. Post Martin Luther King Black leadership’s failure to understand the economics and job creation of has kept Black America on a civil-rights footing with civil-rights (simply a law) as our highest priority since the civil rights era. If civil-rights is all one knows with no knowledge of the economics of American Capitalism it is no wonder the post Martin Luther King Black leadership has kept Black America on a civil-rights footing. This has rendered Black America unable to contribute Black America’s due contribution to the American economy as other America population groups do. As a result an inordinately high number of Black American languish in poverty in conditions of hopelessness and despair. The surviving group of pilgrims had a rule “If you don’t work and produce you don’t eat”. Too many Black Americans don’t eat because Black America does not produce; we just consume. Black America has significant buying power and can therefore produce at the retail level if this replaces civil-rights as our highest priority. Civil-rights is a law. Black America need not nurse it at the expense of Black American economic progress. As a law it stands on its own. If Black lives really matter to Black America then Black America will get on a do-for-self, job creating economic footing. We are attempting to through our “Oakland Urban Model” which is designed to create jobs from our targeted East Oakland community’s Annual Household Consumer Expenditures through Black ownership of major retail businesses to create jobs and economic opportunity and grow community wealth in our targeted majority Black East Oakland community. With demand well documented, success of our Model under the American Free Market Enterprise System in our targeted community should be a no brainer. However due bank lending redlining disinvestment which makes access to working capital virtually impossible. Thusly, the single challenge in opening or facilitating the opening of businesses in our targeted East Oakland community is funding. We are currently in the funding stage of opening a supermarket in our Targeted East Oakland community that may be only the fourth Black owned supermarket in all of America. We are currently acting to establish Black ownership of job creating major retail by opening a supermarket in our targeted majority Black low income community in East Oakland to capture some of the $127,471,835.03(Over 127 million) that residents of this East Oakland community currently spend annually on grocery (unfortunately mostly in other communities) to create jobs and grow wealth in our targeted East Oakland community. Our supermarket effort propels Black Oakland from the usual “we ought to” “We need to” “We should” etc., to actual action. Our targeted East Oakland community is designated a “Food Desert” with a food related hospitalization rate three times the county average. This new store would provide some 60 new jobs (FTE) with more jobs possible through future franchising of our supermarket. Having completed a strong Consultant assisted Business plan together with an attorney developed and federal and state filed stock offering to raise working capital, we are now pursing what will likely be an SBA backed loan for build-out and pursing the sale of our stock for working capital. Our success at finding, especially the sale of stock to raise working capital may become a model or a study of funding major retail business in low income urban communities. To learn more about our funding plan click here. To follow our progress in opening a supermarket in our targeted East Oakland community go to www.cityeastmarkets.com and click on “Follow Our Progress” on home page. USE YOUR BROWSER BACK BUTTON TO RETURN TO THIS PAGE.